Bio: A powerful fighter, self-centred and boastful. Fearless, daring, believes himself to be the superior of his fellow Autobots. Shell-resistant and reinforced hull can withstand enemy bombardment and extreme temperature variations. Possesses solar powered auxiliary engines. Acetylene blaster inside cockpit shoots 3000 degree celcius flames. As a space shuttle, has inter-planetary travel capabilities – maximum speed 30,000mph, range 40,000 miles. This massive, powerful metal braggart is one of my favourite Autobots. 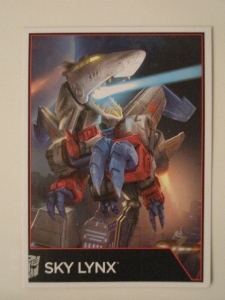 There's just something about this mighty space dino-bird/ puma combo that's always fascinated me. Whether its from too many repeat viewings of The Return Of Optimus Prime, or pouring over his Universe profile, something about this upper-middle class flight lieutenant has just really captured my imagination. 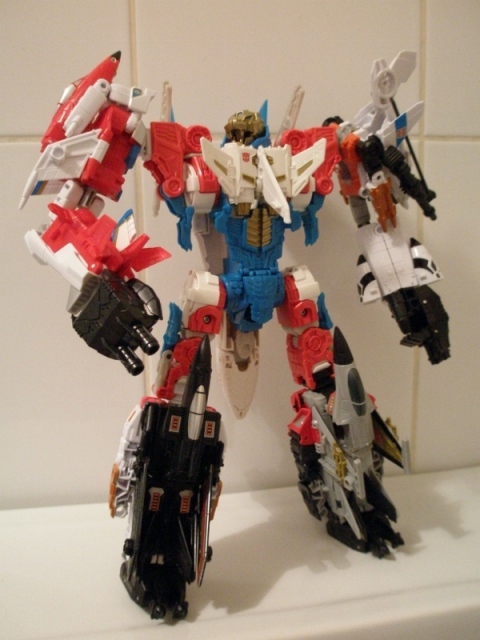 Its the combination, I think, of a very strongly defined character, and a cool multi-functional robot mode. I liked that he had two distinct robot forms, and whilst his media appearances largely focused on him utilising one or the other at any one time (or treating him like a Triple-Changer), I was always fascinated by the idea of this guy basically being a team of himself. That, and I love animal-based Transformers (so much more interesting than ten-a-penny cars and jets). I especially enjoy his preposterous personality and arrogance – something which makes him strangely endearing. The original toy was something I didn't get to play with until 2009, when the Encore set rolled around and it left me with mixed feelings. Its massive for one thing, dwarfing most of the other Autobots (even Metroplex) and is hobbled a little by working in a creaky Zoids-like action feature; sticking a bunch of batteries in made the puma mode walk. 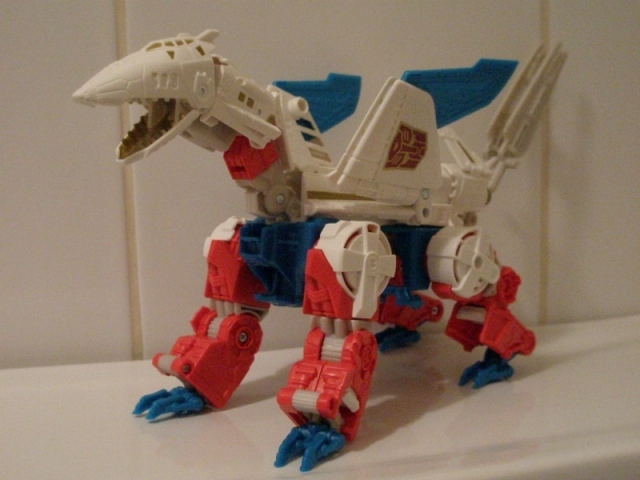 Whilst I'm fine with battery features in something like Trypticon, which you expect to be slow and plodding, for Sky Lynx , who's constantly active and bouncing around the place, it just didn't work. I also found the super-huge scale of the thing made it a bit awkward to play with, meaning he fell into the category of stuff like Fortress Maximus – a big sort of show-off toy that you never touch. I like a big robot toy as much as the next man, but if you have to clear half your living room to find space for the thing, then that doesn't really lend itself to repeated play. It felt a bit compromised as a result, which was a shame, and I'd invariably leave the lynx mode lying around, in favour of just swooshing the Dinobird (Archeopteryx, shurely?) about. Such mixed feelings of a half-way house been play-set, motorised toy and Transformer meant I eventually sold Sky Lynx on. All of which is a massive wibbly pre-amble for one of the most exciting (for me – your experience may vary) news to come out of the current Combiner Wars line ; a new Sky Lynx toy. There's a few reasons for this; I'm bored of endless updates of the '84-'85 cast, (who to my mind, have toys that are already excellent and don't really need an update) so when Hasbro ventures into some of the lesser lights of '86 and up, I'm always super excited; having a Transformer that doesn't have a typical robot mode is something I like, and its mother- flipping Sky Lynx!!! Robot Mode: Hasbro's design team have plumped for a representation of the original's combined mode - its a four-legged flying dinosaur!! Oh, I can't tell you how happy this makes me. Its a good size in hand, I love all the moulded detail (even though it again whiffs of Third Party) and the pleasing chunkiness of this thing. The bird-head is really nicely done and decently expressive, thanks to a well articulated neck, the wings look good and can move about, they've got the blue 'feathers' of the original and it just looks fantastic. The colour choices of the plastics are well made, and I love how bright and crisp they are. Hasbro's usual stinginess with the paint pot is actually one of the few occasions that sort of penny-pinching makes sense – the minimal daubs of gold are all Sky Lynx needs to look AMAZING. Alternate Mode: The shuttle transport mode is cool. I've always loved this thing. Okay, technically the crawler section should detach and blah blah blah, but I find I like the mix of areodynamics of the shuttle coupled with this boxy nonsense on the underside. The alt mode is very slick indeed. The shuttle design is more hench, pointed and slick looking than the original Nasa-derived chubby-fest and I love the backwards facing tail fins, which give this some extra character and ferocity. Sticking the blades he comes with on for an attack mode never looks good though. Alternate Mode: As I was playing with this toy, I was a tiny bit disappointed that there's no separate puma mode for Sky Lynx, but I am more than happy with what the designers have pulled off – making Sky Lynx's torso mode a glorious puma-headed God for you all to prostrate yourselves in front of. Yes yes y'all, Sky Lynx brings his unparalleled abilities to the realm of gestalts, and cracks out what can only be described as an Egyptian deity made techno-flesh, as the imposing Sky Reign. 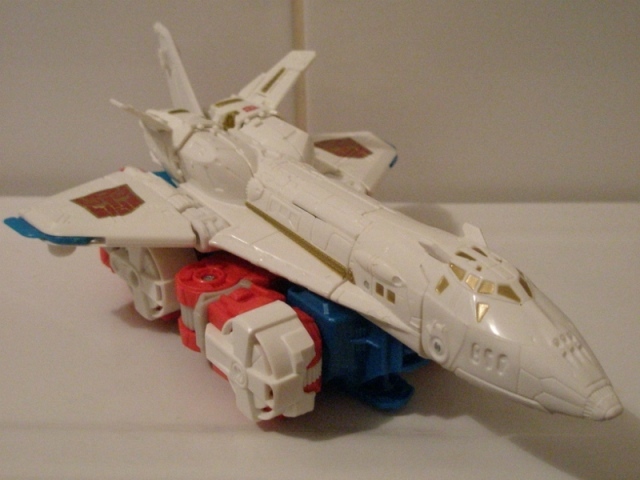 I've teamed Sky Lynx up with Aerialbots because they're the only Autobot Combiner Wars limb-bots I have and because the Autobot Cars you're supposed to use look ugly as sin and a horrible child's painting swirl of mismatched colours. The Aerialbots, on the other hand, lend Sky Reign an air of grace and power, as well as a complimentary colour palette. “Consistency is the key to victory.” indeed.